In a little over two months, it will be eight years since Jeff died. It seems unfathomable to me that he’s gone. Seems unfathomable that it’s been so long. Seems unfathomable that it’s been such a short time. Sometimes my shared life feels like it happened to someone else, and in many respects, it did happen to someone else. I’m not that same person. I don’t know what happened to her, don’t know exactly what (or who) has replaced her. At other times, although I am no longer caught up in the breath-stealing agony of new loss, I feel as if my life stopped when grief began, and in a way, that is also true. I cannot live in the past. Although I am way too introspective for my own good, I never, ever, think about what my life would be like if he hadn’t gotten sick. If he hadn’t died. There is too much pain in that thought, too much negation of the reality of our lives. At the same time, I cannot live in the future. We can never know what the future holds, can’t guess the traumas, such as my horrendous fall, can’t even guess what good might happen. 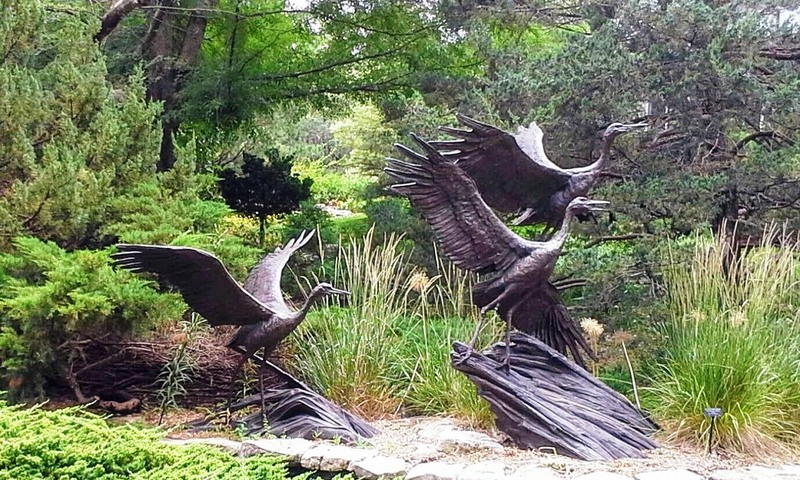 So, like this heron sculpture I photographed in the botanical gardens in Wichita, Kansas, I am forever poised in the moment with the past gone and the future not begun. It seems odd to feel in any way that my life stopped when Jeff died since I truly have had an incredible number of experiences and adventures in the past years, experiences I would not have had if Jeff were still alive. I sometimes wonder what he would think of what I have done, what I have yet to become. But that thought brings pain, too. I used to think living in the moment was living on a knife’s edge, but now I prefer to think of it as living in the very instant before I take flight. It seems a bit more hopeful, as if I will eventually soar, but for now, all I have is that frozen flight. I was going to add that I wish I knew that my life would work out (rather than the dread I have of being lonely and broke and old) but I really don’t want to know. If wonders are in store, then they will be a joyful surprise. And if not? Well, I’ll deal with that dreaded future when it happens. So here I am — as we all are — poised forever at the very moment the future begins. There were maybe hundreds of such sculptures scattered around the part of Kansas I visited, as if the whole place was an outside art gallery.